We purchased an ocean front home in White Rock. BC, Canada 8 years ago. 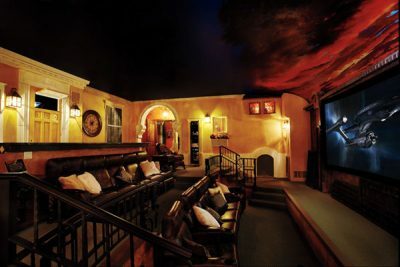 The house had an unfinished basement, and we always envisioned using the space for a dedicated theater. 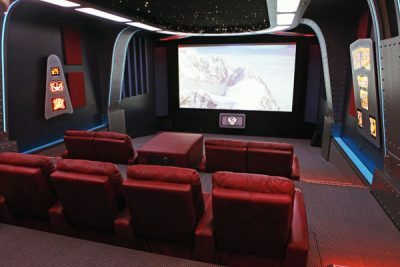 We have handled many home improvement projects over the years, and as a long-time subscriber to Home Theater magazine, I knew that I was up for the challenge. The project took five years from start to finish, and we are ecstatic with the results. Our first challenge was to decide on what equipment would best compliment the project. I visited Paul Wong at the Sound Room in Vancouver and knew immediately that he was the right person to share my passion. Paul advised me that apart from the equipment the most important aspect of any home theater is the acoustics and the location of the speakers. Section T Consulting helped design the theater layout and completed the bar area. They addressed all other sub-systems as well including ventilation and heating, which had to be modified to suit the intended use of the space, a detail that is often overlooked. The Theater is 15ft. x 20ft. with an 8ft. ceiling. We wanted to keep the ceiling as high as possible especially since we were planning to install acoustic tile with fibre optic lights, which proved to be a greater challenge than I expeted. The interior walls were completed with a double sheet of drywall attached to resilient RC-1 channels, creating isolation between the drywall and studs to enhance sound quality. I installed all the cables and equipment and an installer from the Sound Room optimized the audio and video as part of the final phase of the setup phase. Keylime Design & Marketing Inc.created and supplied the acrylic LED sign and handled the photography. When deciding on a paint color that would help darken the room and coupled with gold trim, the final look is very classy, reminiscent of older style theaters. The doors are solid core and custom made by a local supplier. We installed seven Palliser black leather seats with bass transducers built-in. The three in the front recline, and a riser allows the back row of seats to have an unobstructed view of the screen. We chose Lutron lighting, which is easily controlled, along with all the AV gear, with a Harmony 900 remote control. Since audio is my passion, I included a Pioneer SACD player and a Sonos audio streaming system so we can enjoy all our music from the theater and the bar area. Paradigm speakers were used throughout with a Definitive Technology subwoofer in the front. 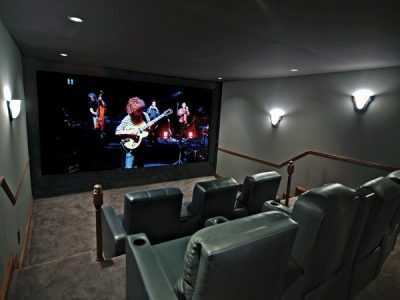 The video is equally impressive with a JVC DLA HD500 project paired with a 77” DaLite screen. A Middle Atlantic rack was installed for all the components and provided easy access from the rear for installation and maintenance. The separate bar area includes Paradigm in-wall speakers and a Samsung 40” flat screen HDTV. The sound is simply amazing and the two areas – theater and bar – compliment our social activities where we enjoy entertaining our family and friends. Choosing a name for our Theater was a highlight of the process, as it meant we were near completion and could start to enjoy the theater we worked so hard to build. The name ”Into theMystic” exemplifies a sense of mystery and wonder. When we celebrated our long-awaited opening night of “Into the Mystic”, we hired a personal chef to cater the event for 60 guests. We even had a red carpet and photographer to welcome them, making them feel like celebrities. We couldn’t be more thrilled with the results and plan to host many social functions around the theater including sporting events, Oscar night, and, of course, movie nights. Ultimately, this was all possible because of the information and expertise I gained from reading Home Theater magazine. I’ve always loved going to the movies. Most of my childhood Saturday mornings were spent at the Palace Theater in Winchester, Virginia, where I could watch two films, cartoons, a newsreel, a short, and coming attractions—all for a quarter. About three years ago, I was surfing eBay and ran across a listing for a movie poster from the 1956 horror film The Mole People. I became obsessed with that poster and soon found myself in a fierce bidding war. Later, I realized what was really going on. The Mole People poster had rekindled those childhood memories, and I somehow wanted to go back in time and relive those special Saturdays. That’s when I decided to design and build an ornate 1950s style home theater. 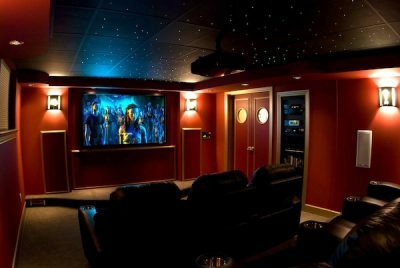 The space I chose for my theater was a 14- by 38-foot upstairs bonus room that I’d designed into our house when my wife, Patricia, and I built it in 1993. The room had an alcove at one end, and we realized later that it would be perfect for a home theater stage and screen. I began doing research immediately, searching the Internet for information on all aspects of home theater design and equipment. I read back issues of Home Theater and any similar pubs I could find. I visited A/V dealers and pestered them with technical questions about types of projection systems, acoustics issues, construction, and so on. The more I learned, the more I didn’t know. In some cases, I got conflicting information, which just confused me more. I’d been unable to locate examples of 1950s style home theaters. I saw either very modern or simple earth-toned, sedate rooms. But I wanted the gaudy, over-the-top, outrageous look of the old movie palaces. By this time, I had acquired many reference books on the history, construction, renovation, and preservation of the grand movie houses, and I began to develop my own vision for a theater. I also found a couple of theater owners’ equipment catalogs from the 1930s and ’40s, so I knew exactly what the various vintage theater items looked like. But where was I to find them? Looking in antique shops for theater items wasn’t getting me anywhere, and I was getting discouraged. I wanted my theater lobby to have original movie posters from my favorite 1950s science-fiction and horror films, and these posters were hard to find, as well. I tried eBay again. I set up searches for posters and vintage theater items that I ran every day for almost three years! I really had to persevere, because these types of vintage theater items are getting harder to find as time goes by. Sometimes, I would search for weeks and find only one item. The hardest items to find were the wall sconces. I had no trouble finding two or three, but I needed six! Finally, after almost three years of searching, I saw a listing for two 1930s sconces from a theater in Ontario, Canada. I e-mailed the seller to see if there were any more. To my amazement, she replied that she had eight altogether, six with their original parchment shades! Up to this point, I’d spent two years researching home theaters. One day, I was telling my son, Tom Jr., that I was still analyzing my theater design, and he said, “Dad, you’ve got analysis paralysis! You need to start building something!” He was right. Although I have good working knowledge of A/V components and systems, I had never tried to build anything like this, and I had become consumed by the fear that I would do something wrong that could not be corrected. First, I painted the ceiling a very dark blue to simulate the night sky. I used a tinted primer and was surprised to find that it took four additional coats to completely cover the previously white ceiling. I also painted the theater and lobby walls using a warm gold color. Meanwhile, I ordered my projector and screen, having settled on the Sanyo PLV-Z2 LCD projector and the Da-Lite Cinema Vision Da-Snap 45- by 80-inch screen. I used two-by-four studs to build the screen wall, painted them flat black and mounted the screen. I also painted the wall behind the screen flat black to eliminate any reflections and stapled black Acoustone speaker-grille cloth around the perimeter of the screen to allow maximum sound transmissibility from the speakers, which would be located near the screen. Then, working with the projected image and the manufacturer’s recommendations, I determined the optimal location for the projector, seats, and seating platform. I also used two-by-fours for the stage foundation and added a subfloor made of two sheets of plywood interleaved with 30-pound roofing felt and a top layer of Pergo laminated wood flooring. The roofing felt helps eliminate rattles caused by low-frequency sounds. I recommend using wood glue and deck screws for all joints. Predrill holes for the screws, apply the glue, and fasten with deck screws, and you will have tight, solid joints and no rattles. I used the same technique for the seating platform. Always lay the beams on the floor at the hardware store before you buy them to make sure they aren’t warped. I didn’t pay attention with my first batch and made the mistake of trying to screw together warped beams. I get the most compliments on the columns flanking the stage. They are pine with resin capitals, available by special order from Home Depot. I had been experimenting with a variety of gold paints and didn’t like anything I tried. A decorator told me that the only paint that looked like real gold was Ralph Lauren Duchesse Satin Ballroom Gold, which had been discontinued because it streaked badly when people used it to paint entire walls. After calling all over the country to find some, I checked eBay, where I bought two quarts for $100. The paint is very thin, almost like a glaze, so, when I painted a test piece of molding, I was very disappointed with the result. Then, I noticed that the flat paint I had put on the walls was about the same gold hue as the Ballroom Gold, so I primed a piece of molding with it and then painted the Ballroom Gold over it. It looked dull at first, but, when it dried, it shone with the most gorgeous, vibrant gold color I’ve ever seen! I have 2,000 laserdiscs, so I located a preowned Pioneer Elite CLD-99 laserdisc player. I also purchased a Samsung DVD-HD931 DVD player and a Monster Power HTS2600 power conditioner. The final component I bought was a DVDO iScan HD processor, which provides high-resolution video scaling of standard-definition video content. The receiver (the Yamaha RX-V2090 with an external Yamaha DDP-1 AC-3 decoder), B&W; speakers (DM602s and CC6 center channel), and a Velodyne 10-inch sub were from my previous system. For the time being, I decided to ignore all of the information on acoustic treatments, and I think the sound in the theater is excellent. At some point, I will engage a sound engineer to properly calibrate my system. My original goal was to faithfully recreate the nostalgia and charm of the fabulous movie palaces of the 1950s, and I think I have accomplished that. When it’s show time in the Kern Theatre, the chandeliers and wall sconces gradually dim, and the main curtains slowly open, revealing a gold curtain behind them. Sound fills the room as the gold curtain slowly rises from the stage floor. At that moment Patricia and I are eight years old again, and it’s Saturday morning at the movies! Persevere If You Want Vintage. 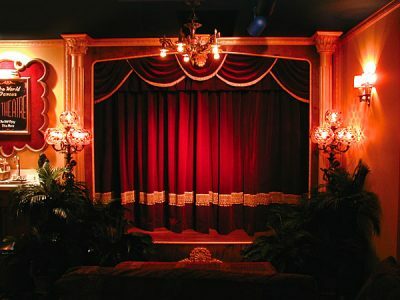 If you like the idea of doing a vintage theater, the stuff is out there, but be prepared to spend a lot of time and money finding it. It took Thomas Kern three years and $6,000 to acquire all the vintage items for his theater. Don’t Reinvent the Wheel. Learn the tricks from the ones who have done it. Avoid warped lumber—always check boards by laying them on the floor before you buy. Avoid rattles by using wood glue and deck screws for all joints and roofing felt between plywood sheets. Measure twice, cut once.